A donation to WOUB is an investment in yourself and your community. WOUB improves lives, imparts knowledge, stimulates conversations, inspires creativity and provides front row seats to amazing performances. Support public media, become a member today! We offer two of our easiest pledge options (above), or read on for further ways to give. Would you like to ensure the future of WOUB for your grandchildren and their children? Consider a planned gift by including WOUB in your will. WOUB’S Cornerstone Society was established by members who want to ensure the future of public media. They want to continue learning and to remain engaged with their community. They want to be inspired, and to inspire future generations. WOUB’s Cornerstone Society gifts begin at $5,000. Gifts can be given in lump sums, pledged over a period of time or given as planned gifts, annuities, and endowments. Remembering WOUB in your will is a wonderful way to leave a legacy for future generations. Please contact Jeannie Jeffers, Director of Development at 740-593-4786 or jeffersd@ohio.edu. Your business can help sustain quality programming. Underwriting, which is business sponsorship for programming, helps to show local business commitment for public media. People are bombarded with advertising messages every day. People tune in to public media is to get away from the clutter that commercial programming offers. Public media programs offer programs that people can enjoy without having to filter out suggestive marketing messages. Companies benefit from being associated with public television and radio. Almost 85% of consumers believe that supporting public television creates a positive image for sponsors. Nearly 75% of PBS viewers believe that PBS sponsors are committed to quality and excellence. Almost two-thirds of PBS and NPR viewers and listeners are more likely to purchase the product or service of a PBS or NPR underwriter. Underwriting simply provides support from a business in a non-threatening way. Because public media does not have as many sponsors as commercial television, your message will have a greater impact. Underwriting helps continue a tradition to continue quality, commercial-free programming. The diverse programming on WOUB appeals to people of every age, psychographic and demographic. WOUB is a non-profit organization that relies on individual and business support to continue quality programming and services. A corporate support representative can help you maximize exposure for your business. Your sponsorship is important to the community and the rewards come back to you in the form of loyal customers. Contact WOUB’s corporate support representatives to find the best way your business can benefit from underwriting programs on WOUB. What’s easier than unloading an old car and allocating funds to donate? Donating your car is an easy way to handle both. When you donate a vehicle to benefit WOUB, you actually turn your car into the community programming you love. Donate a vehicle and we’ll use the proceeds to support your favorite daily hosts and programs like, “Crossing Boundaries”, “Newswatch”, “Gridiron Glory”, “Nova” and all of the public affairs and cultural programming you value. 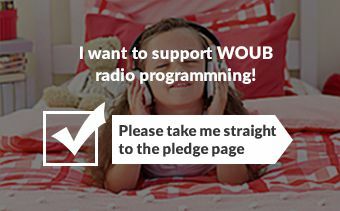 Your gift makes a difference at WOUB! Donating a car is fast, easy and secure. WOUB accepts any vehicle – running or not – including cars, trucks, boats, RVs, motorcycles, and more. We work with our public radio colleagues at Car Talk Vehicle Donation Services, to ensure that your donation delivers the highest possible revenue to WOUB and that your experience is convenient, efficient and even fun. For more information about how to donate your vehicle, call our vehicle donation program partners at (855) 845-1960, or click the button below to get started.